On a road trip from San Juan to the Puerto Rican rain forest, four-star chef Eric Ripert brakes for green coconuts and fried plantains, and finds the inspiration to create eight marvelous Latin-accented recipes. The friendly Texan ladies next to me at the hotel bar are happily at work on identical plates of chicken quesadillas and french fries. Other dining options on the 17 acres that comprise the Caribe Hilton include a Northern Italian restaurant, a Spanish tapas bar, a Chicago steak house, and a dining room serving everyone's favorite cuisine, International. All of which should be enough to satisfy any normal tourist down from the mainland, but it is my misfortune to be plagued by visions of life outside the Hilton compound. I happen to know that elsewhere in Puerto Rico, suckling pigs are turning slowly over burning charcoal, plantains are swaying in hot fat, vats of red beans are murmuring on back burners. What I need is a local guide. Somebody island-born and Spanish-speaking who knows the difference between mofongo and mondongo, and can tell them apart at 50 paces. Somebody with a gut that billows proudly before him like the front grille of a PT Cruiser. What I've got is a skinny French guy. I'm in Puerto Rico with Eric Ripert, the chef at one of New York's greatest and most expensive restaurants, Le Bernardin. Normally you won't hear me complaining about hanging out with a man whose idea of a grilled cheese sandwich involves smoked salmon and sevruga caviar. In Manhattan, Eric Ripert can do no wrong. But in San Juan? As soon as Ripert bounds into the bar, though, my chances of encountering red beans and suckling pig start to rise at a near-vertical incline. First, he tells me that he's been coming to Puerto Rico at least annually for 16 years. It's his favorite place to disappear to when things get to be too much, so he knows his way around. And he has spoken Spanish all his life—he grew up in Andorra, that bottle-cap-size country that sits high in the Pyrenees, stranded between France and Spain like a backpack that someone lost on a hiking trip and never went back to retrieve. Most promising of all, he's here to visit his great friend Alfredo Ayala. Ayala is Puerto Rican, well-connected, not quite skinny. Ripert met him in 1986 when they were both working at Joël Robuchon's late Paris restaurant Jamin; Ayala invited Ripert home to Puerto Rico for a visit. Ripert took him up on it almost immediately, showing up on his next vacation with his latest girlfriend. Over the years there were many vacations and at least as many girlfriends, until the day when Ripert got off the plane with a woman and Ayala said, "Eric, you're going to marry this one." Ayala slips his Jaguar into the stream of taillights pouring into Old San Juan. "It's so good to be back in Puerto Rico," Ripert says, as we slide past the ruins of a Spanish fort. He hasn't been here since January, when he came with two photographers, a painter and a writer to put together a chapter for his new book, A Return to Cooking. "You spend a week here and you come back feeling...strong!" He punctuates this with a raised fist. In the morning, Ayala will drive us to the El Yunque rain forest, where he keeps a restaurant, and the day after that he and Ripert will cook a Puerto Rican feast. But tonight he's going to take us around the old colonial quarter of San Juan for dinner at Aguaviva, a year-old spot where a cosmopolitan crowd dines on shellfish platters and Nuevo Latino seafood under cool blue lights that give the whole place a coral-reef feel. Some friends of Ripert's show up, and then some friends of theirs, and pretty soon we have taken over a whole corner of the dining room. One waiter seems to take it as his sacred duty to refill our wineglasses; another, tipped off that a celebrity chef is in the house, brings us everything on the left side of the menu, starting with a mussel seviche, and then moves to the right side, with a couscous-based paella, ignoring our pleas to stop. Then somebody mentions that there's a salsa festival in town all week, with bands and dancers from around the world. 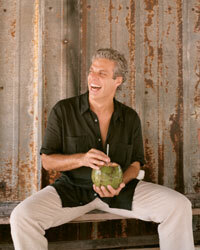 "I've been coming to Puerto Rico 16 years and I've never learned to dance salsa," Ripert says with a long face. "Can you believe?" A girl at the end of the table offers to teach Ripert to dance if he'll show her how to cook. He looks doubtful, but in a few minutes we are speeding back toward the Hilton, where the night's big salsa event is underway. We breeze past the doorman. Ayala buys a round of Cuba Libres. An all-female Colombian combo is on the stage, spellbinding in blue-sequined halter tops and matching hip-huggers. There are 12 of them, or maybe 13. I keep counting, and keep losing track. They won't hold still. Unbelievable things are happening on the dance floor. The people here seem to have evolved extra joints that allow their hips to move in ways unknown off this island. We watch a girl with a 12-inch waist and Crystal Gayle's hair shimmy with an intense bald man whose white shirt is unbuttoned down to the equator. They look like they've been dancing together at least 40 years, which would be several times longer than she's been alive. Ripert tries to make like the locals, but it's hopeless. "Sixteen years," he says, shaking his head grimly. A bit too early the next day, Ripert and Ayala pick me up for a trip to a market in the Santurce district, southeast of Old San Juan. Ripert's first stop is a botanica selling the magic candles, herbs and other items with which Puerto Ricans supplement their Catholicism. "I always come here to get candles," Ripert says. "For protection. My wife thinks I'm crazy. Of course, I am." The market is Sunday-morning sleepy, with a handful of laconic vendors adjusting their displays of tubers in endless varieties and plantains of outstanding girth. Ripert and Ayala pick out some fruits and coconuts for later use, squeezing and pinching and shaking. After loading our groceries into the trunk, we start the two-hour drive to Ayala's restaurant. Actually, there's a multilane highway that will get you there in about 45 minutes, but the multilane highway doesn't go through Piñones. When I dreamed of plantains bubbling happily in hot fat, I was imagining someplace very much like Piñones. The map indicates a town, but Piñones is really not much more than a turnoff on Route 187 where a dozen or so Chiclets-colored shacks provide fried snacks for motorists on their way to or from the beach. The culinary technology at Piñones must look paleolithic to Ripert. It would look paleolithic to a sidewalk hot-dog vendor. Massive pots of oil, shellacked to a profound blackness by seasons of smoke and burnt grease, sit above burning slats of wood that seem to have been salvaged from the wreckage of the last hurricane. The cooks—most of them women—roll mounds of batter into fritters using a sea-grape leaf. When the fritters have the burnished hue of an old saddle, they're threaded onto coat-hanger wires or car-radio antennas to drip and cool. Those fritters: First, the bacalaito, a deep-fried pancake of salt cod, garlic, oregano, flour and water. Then, the alcapurria, a long, deep-fried torpedo of grated arrowroot or yuca filled with ground beef or crabmeat. Finally, the signal achievement of Piñones, possibly the form to which all fried foods aspire, the pionono. A sweet plantain is wrapped around a handful of ground beef or crab, then covered with a simple egg batter that holds the whole package together as it fries. All the shacks have the same menu. Ripert prefers one called El Piñonero, although it's distinguishable from Mi Sitio and Melody and El 24 de Diciembre only by its color, which is blue. "Did you try the alcapurria de jueyes, with crabmeat?" he asks, holding one out to me. "It's fantastic, right?" Then, mixing his messages, he says, "Don't eat everything. We are going to another shack. It's much more typical. This one is almost too sophisticated. Where we're going, it might not even be there anymore. It was there in January, but if there was a strong wind last week" He trails off, leaving me to picture fritters blowing down the highway like tumbleweeds. Luckily, El Primero y El Último is sturdier than it looks. You wouldn't call it sophisticated—while we place our orders, a pregnant mongrel noses around our feet—but the cooking here has a layer of refinement that sets it apart from El Piñonero, if the definition of refinement can accommodate a deep-fried torpedo. Still, we are centuries away from the checkerboards of raw fish Ripert assembles back home. "The meal I am going to make tomorrow, it won't be fancy, because Puerto Rico is not about fanciness," he says. "It's about strength. It's about power." We buy green coconuts for the road and stand back as their lids are lopped off with a machete. Coconut water, drunk straight from the shell through a straw, is said to settle the stomach, making it a wise insurance policy on this day of fritter hunting. Ripert notices everything on the roadside, from the blindingly white egrets standing frozen in the grass to the stooped old man loading his red wheelbarrow with fallen coconuts. As we begin to climb away from the coast and into the mountains of the El Yunque rain forest, he calls out, "Look how thick those bamboos are! That tree there—red and yellow and orange and green all together! That's God being creative." We pass a strip of gas stations. "And that's us being creative. Hmm. We have some work to do before we catch up." A monk parakeet swoops low over the car as we pull up beside Ayala's restaurant, Las Vegas. Ayala bought the place in 2000 and gave it a clean, modern look and tropical-fruit colors. Ask him how it looked before the renovation and he closes his eyes and shudders expressively. He didn't think much of the name Las Vegas, either, but he kept it out of respect for the families who'd been eating there for years. Instantly, Ayala and Ripert head to the bar to construct a rum punch: oranges, limes, sugar, Puerto Rican rum. The surprises—and a rum punch needs to have some tricks up its sleeve to surprise me—are basil leaves and Thai chile peppers. Poured over crushed ice, with a topping of nutmeg, it's hot and cold and sweet and sour and just exactly what we need to take the teeth out of the afternoon heat. Dinner at Las Vegas is my first hint of what Ripert and Ayala are plotting for tomorrow. The food is lovingly faithful to the spirit of Puerto Rico, yet Ayala's training abroad betrays itself in the way the flavors have been sharpened and focused. An appetizer of dorade skewered between squares of bacon brings Ripert to a dead halt. "This is very good," he says, popping another chunk of grilled fish into his mouth. "It's very good. Alfredo, what is the sauce?" Ayala gives up his secret: a passion fruit reduction with whole-grain mustard, one of those two-ingredient miracles that are only possible from a chef who knows when to stop. And now it is time to stop. Tomorrow holds a full day of cooking, and eating, and the chefs need their sleep. When I meet up with Ayala and Ripert at a friend's house the next morning, the temperature is already in the 90s; the humidity is near the saturation point. The 800,000 Puerto Ricans living in New York City may be the only people in history to have moved there for the weather. Ripert is bowed over the stove, wearing shorts and a gold chain. That's it. "Forget the Naked Chef," he says. "Here's the real naked chef!" Stockpots are blowing more steam into the air, if that's possible. Ripert is browning chicken for his coconut coq au vin. "There is nothing more French than a coq au vin," he says. "And then to add coconut milk to that! My God! That is pure Puerto Rican inspiration." His tenure in France peeks through everywhere; he's skimming, degreasing and tasting all the time, scooping away some of the chorizo broth in which he'll simmer the red beans, adding fresh water to dilute the salt. His assistant, Andrea Glick, is doing what chefs' assistants do: slicing garlic, chopping parsley and blithely ignoring Ripert's hints that she's doing it all wrong. Ayala, for his part, is stewing pigeon peas with some herbs from the yard. Satisfied with his progress, he leads me along a serpentine path through the garden on a quick botanical tour. The jungle has a hyperactive imagination. Every plant is pushing out a flower or a fruit, and each one represents a completely new idea of what a flower or fruit should look like. At our approach, bright green lizards make superhero leaps onto the nearest banana leaf. As Ayala stands on the patio, pointing out the course of a small stream that cascades down a ravine to the ocean, a ripe breadfruit crashes to the concrete with a meaty slap familiar to devotees of the boxing ring. From inside, I hear Ripert calling, "El lechón! El lechón!" He emerges onto the patio, trailed by a man carrying a roast suckling pig. I'm pretty sure it's the same pig that had been rolling above the charcoal pit of my dreams back at the Hilton. "Is that part of your menu?" I ask. "No, it's for us to snack on before the guests get here," Ripert says. Then he tears off a crisp, golden ear and starts to chew. And chew. The guests are late—bad news for the structural integrity of the suckling pig but good news for the chef, as the coq au vin is taking forever to get tender. "That's because it's a real chicken," Ripert says, "not one of those stupid birds we get at home that cook in five minutes." And it gives him time to split the gambas—a kind of shrimp—so that by the time two cars pull into the driveway, he's ready to light the grill. The shrimp cook in just about the time it takes Ripert to brush them with shallot butter. A squeeze of lime, then an incendiary shot of rum, and they're ready for their trip to the buffet table, already loaded with coq au vin, pigeon peas, red beans, white rice and smoked salmon on fried green plantains. It rains a lot in the rain forest (hence the name), but today the humidity can't seem to find the energy to organize itself into drops. One of Ripert's guests, a man he describes as "the godfather of the island," has brought cigars. Ripert pulls on one, sending plumes of smoke into the jungle. He's been cooking for seven hours now, and the heat is finally catching up with him. Luckily, dessert has just four ingredients—bananas, lime juice, sugar and eggs—which will come together in a soufflé that, in this climate, may actually be lighter than air. Finally, there's nothing left to cook and nothing left to eat. Ripert suggests that we all drive up the mountain for a swim. "There's a waterfall up the road. You stand under it and you just feel so..."
You can have your well-fed local guides. Me, I'm sticking with the skinny French guy. Pete Wells is a senior editor at Details.